When it comes to kale, I find people either love or loathe it. As for me, I will admit that I’m not much of a fan- its dense texture and lack of natural flavor is akin to eating cardboard. That being said, it does not mean I have permanently crossed kale off the grocery list. It just means I had not yet found a palatable method of preparation for this fibrously leafy (and did I mention: incredibly healthy!) vegetable. 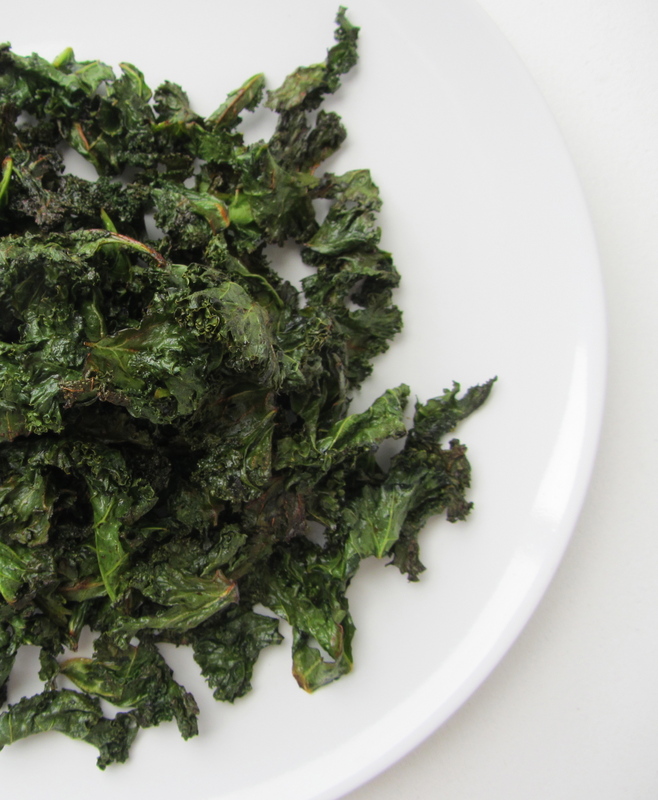 Then one night I was making dinner with my friend Liz, and she showed me just how easy it was to turn kale into a crispy and light, bite-sized snack. In her version, she uses a sprinkling of salt to season the kale; but after making several batches, I found using soy sauce to be more preferable since it not only seasons the kale, it also acts as a marinate for the leaves, which in turn makes for a more flavorful chip. 2. Wash and thoroughly dry the kale. Remove and discard the ribs from the kale, then cut the leaves into large 1-inch pieces. 3. Place the cut leaves into a large bowl. Drizzle the olive oil onto the kale and massage by hand to evenly coat. Repeat with the soy sauce: drizzle and massage until all leaves are evenly coated. 4. Spread the kale in a single layer onto a baking sheet. Bake at 350F until the leaves are crisp, about 10 minutes. 5. Wasn’t that easy? Now go eat!